Once an item of physical evidence has been removed from the location at which it was found, it must be packaged in such a way that it cannot become contaminated or damaged. It is equally important that the item is unable to escape from its packaging for two reasons. First, to preserve the item from contamination in an unprotected environment. Secondly, to prevent the item contaminating other packaged evidence. For example, imagine the consequences of a suspected drug in the form of a powder escaping from its package. This could end up (and no doubt will end up) on the outside of another package so that when this is handled, that drug becomes transfered to the person who opens the package and then on to other items for examination! A knife would be placed into a weapons tube (a hard plastic shell) to prevent the sharp edges from penetrating the tube. If blood is present on the knife, the tube would be sealed with bio-hazard tape. A fingerprint lifted with adhesive tape would be placed on to a clear, thin acetate sheet and then placed into a plastic evidence envelope. A cluster of hairs found in the clutches of a victim's hand could be placed into a small stoppered plastic bottle (called a polypot) and this then placed into a clear polythene evidence bag. A footwear mark lifted using ESLA would be placed into a cardboard box of a shape and size sufficient to prevent it moving around during transit. A swab used to recover a blood-like mark would be placed into its original a plastic swab tube, and sealed with bio-hazard tape. A garment soaked with a fire accelerant would be placed into a nylon bag (because these bags prevent escape of volatile fumes) or a metal container with gas-tight lid. A shoe would be placed into a strong paper bag (unless it was covered with wet substances like fresh blood). 2) says exactly where it was recovered, 3) says exactly when it was recovered, 4) shows the name and job (e.g., CSI) of the person who recovered it, and 5) provides details of exactly who has handled the item after it has been recovered and packaged. 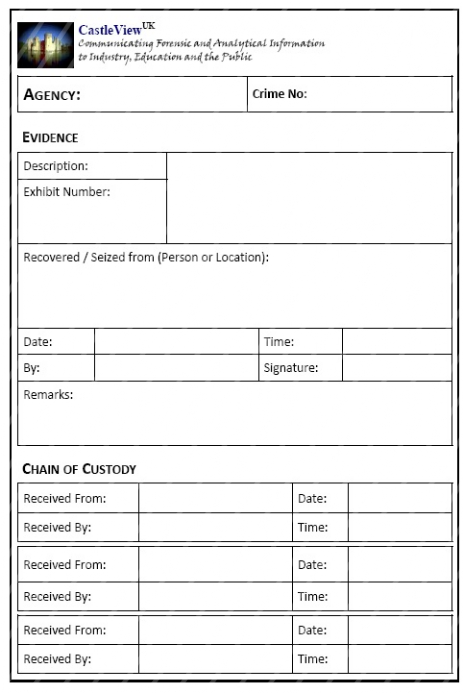 This (5th) part is very important because it gives details of the chain of custody, otherwise called the continuity in the "life" of the item from the moment it was recovered and thereafter. The labels (in the UK) used to record details of the packaged evidence are often called CJA (Criminal Justice Act) labels. 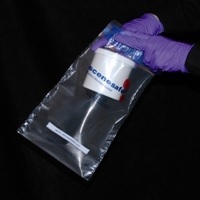 Every item of physical evidence recovered at a scene of crime must be packaged individually in a way that prevents the evidence becoming contaminated or damaged. The packaging may have an integral (printed-on) label, or a label will need to be filled in and attached to the packed item. 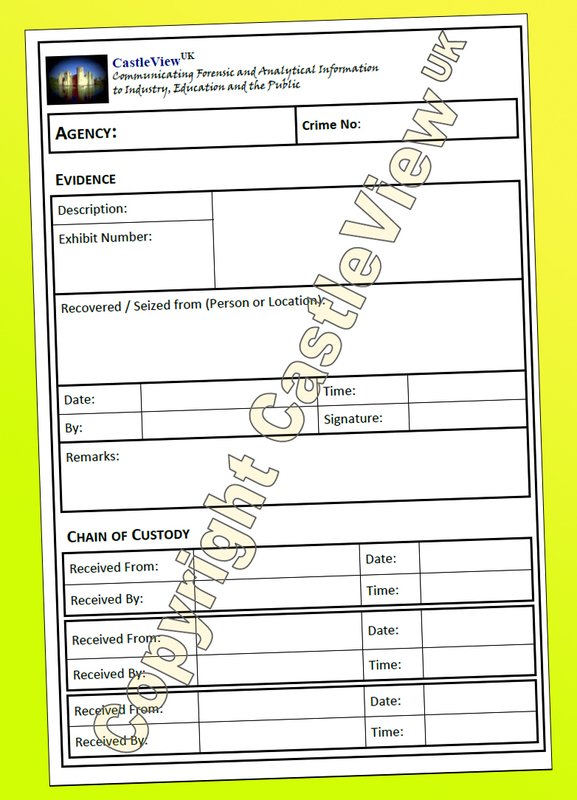 In the UK evidence labels are often called CJA (Criminal Justice Act) labels. These must be fully completed and (if not already printed on the packaging) must be securely attached to the packaging in which the recovered item has been placed and sealed.